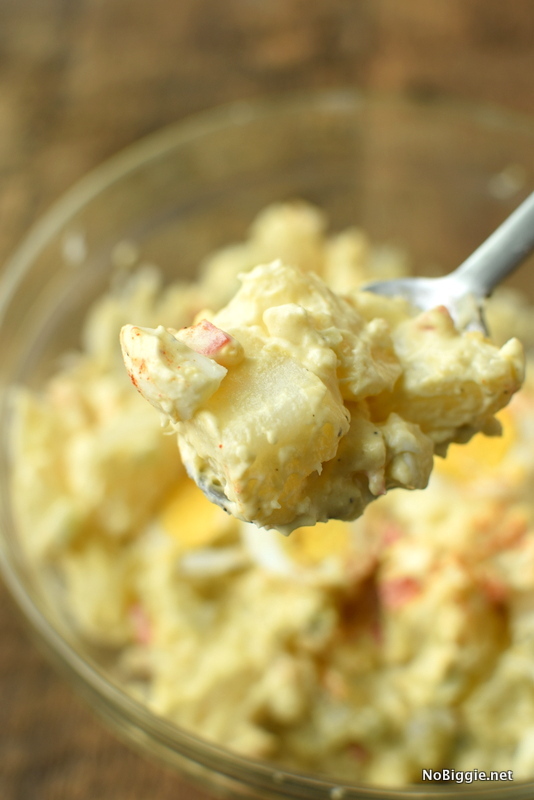 Make Potato Salad in your Instant Pot! My sister makes the best potato salad. The secret is sweet pickle relish…and no onions! It’s the first recipe I was excited to try in the Instant Pot. The best part, is that the potatoes and the eggs cook together at the same time! If you’re worried about any possible bacteria on the outside of the egg shell, don’t…the high temp of the steam inside the instant pot will kill it. We made a quick video so you can see this recipe in action. Do you have an Instant Pot or a pressure cooker? The most nerve racking thing about cooking with an instant pot is touching the quick steam release valve. The steam comes out quick! It always makes me jump a little. This recipe is so quick with the instant pot, with a cook time of only 4 minutes…you can’t beat that! It does take a few minutes for the instant pot to build pressure before the cooking timer starts to count down, but not much. The longest time is the chill time in the fridge. 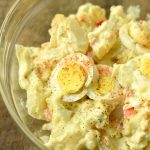 If you love potato salad, this instant pot potato salad is a game changer! 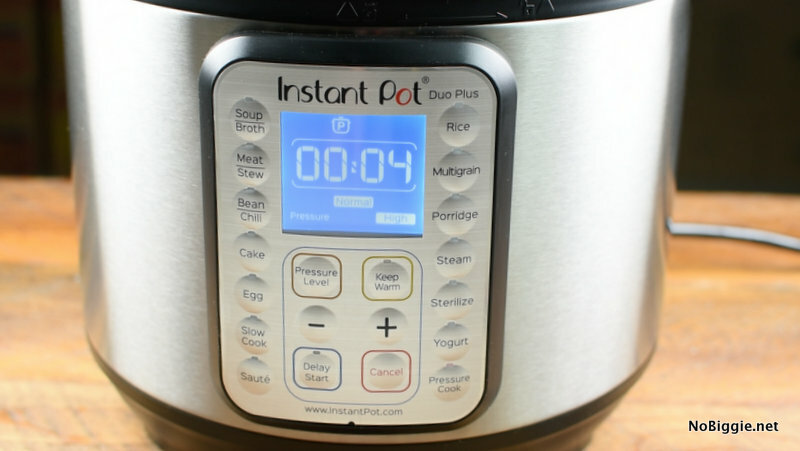 If you’ve been on the fence about purchasing an Instant Pot (like I was), I can honestly say you will love it! It’s a work horse in the kitchen. Like you, I wondered what an Instant Pot could do that my slow cooker can already do. In addition to being the star player in cooking so many different meats, it’s a rice cooker and a yogurt maker. It cooks hard boiled eggs perfectly in a fraction of the time, rice, quinoa and dried beans…and most importantly, it’s not going to blow up your kitchen…haha! Place a metal steamer basket inside the Instant Pot. Add the potatoes and place the uncooked eggs on top of the potatoes. Pour the water over the potatoes and the eggs. Lock the lid in place, make sure the pressure release valve is pointed to: “sealing”, select high pressure, and set the cook time for 4 minutes. After 10 seconds the screen will read: ON. It will take a couple minutes for the steam to build before you see the 4 minute countdown show on the screen. When the timer beeps, hit the cancel button to turn it off. Move the steam release valve from sealing to venting to release pressure. Once the steam is released, carefully unlock and remove the lid. Gently lift the steamer basket out of the instant pot. Place the eggs into a bowl of ice water. When the eggs have cooled enough to handle, peel and chop them up. Reserve one of the eggs to slice and place on top of the salad for presentation. 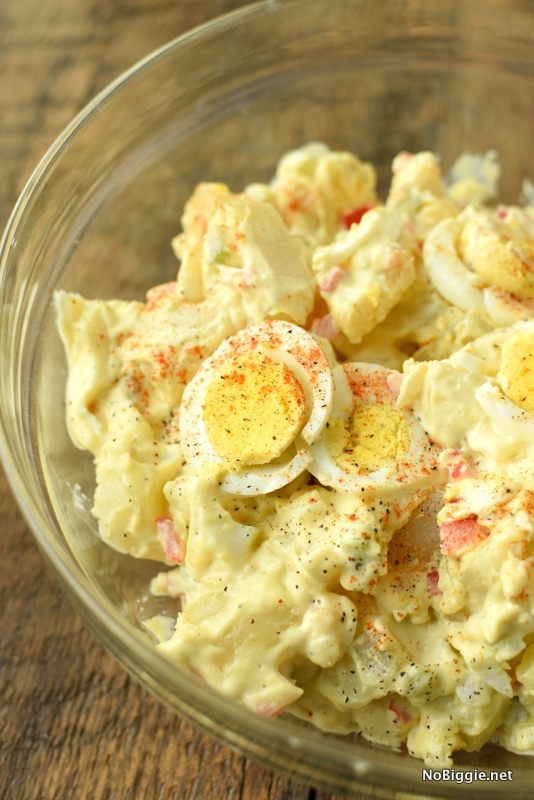 In a large bowl, add the potatoes, red bell pepper, celery, pickle juice, sweet pickle relish, salt, pepper, onion powder, mustard, mayo and chopped eggs. Top with the sliced egg. Cover with plastic wrap and chill in the fridge for one hour or more. Sprinkle with paprika and more salt and pepper right before serving. Enjoy! You can shop the Instant Pot here. – a 7 inch spring form pan that fits inside to make cheesecake! *Affiliate links in this post.